Following last Monday’s post where I explained the link between stress and cortisol, carbs and insulin, and their effects on weight, this post will look further at the implication of stress. It is also now the 6th in the series on weight loss. Can you see your toes without bending over? Is your waistline the largest circumference of your body? Do you feel wired and wide awake even after bedtime? Does your pulse race and breath get shallow during the day (when you’re not exercising)? Do you often clench your jaw or fist or tighten your face or shoulders during the day? Do you crave carbs, sweets, or other junk food between meals or in the evenings? Do you itch for cigarettes, alcohol, or other addictions on a daily or weekly basis? Do you do chronic cardio workouts (more than 30-40 minutes of steady-state cardio)? All except for the last one are symptoms of stress, and therefore cortisol. (The last one is a cause of cortisol production.) So if you answered yes to any of those, you are on the cortisol train. 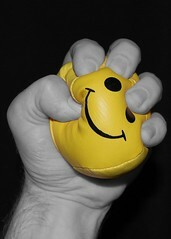 We’ve all been there–my hand it is up–and suffered both the immediate and long-term effects. Even if you don’t eat carbs and therefore don’t think you’re on the blood sugar roller coaster or can’t blame carbs for your belly fat, if you’re stressed, there’s a dang good chance you have more fat surrounding your vital organs than you should, and you have cortisol to thank for that. Certainly diet has a huge influence on the outcome, but in the presence of such a powerful hormone as cortisol, I’d recommend stress relief over disciplinarian-like dieting. So what does that mean? If you’re even slightly afraid of any of the things on that list, I’d highly recommend you find some way to reduce stress and anxiety. And try to be able to see you toes again.